Max Altitude :- 15696 ft.
Approx Trekking Km :- 53 km. Roopkund, in the state of Uttarakhand in India, is a famous glacial lake. This lake is famous due to more than five hundred skeletons of humans that are found at the edge of the lake. It is located in the Himalayas and rests at an altitude of nearly 4,784 meters(15,696 feet).Roopkund is located in the Chamoli district of Garhwal. It is one of the best sites for trekking in Garhwal. It is closer to hill stations like Nainital and Kathgodam. At a distance of 217 km from Nainital and 235 km from Kathgodam, Roopkund is one of the major tourist attractions for people in the country and also for people who are travelling from abroad. You can reach the place through Lohagunj which is 155 km from Almora, where you can travel though any motor vehicle. 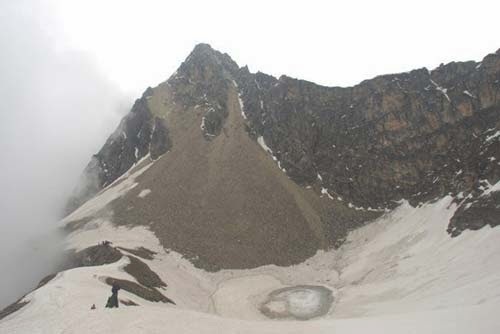 Roopkund, which is located in the lap of Trishuki massif is also known as the ‘mystery lake’. You can find human skeletons at the bank of the lake and it is believed that they belong to the Paleolithic age. These are believed to be the skeletons of the heroes who had fought here in the earlier times. Along with the skeletons of humans, you can also find skeletal structure of horses and other animals. There are reports that these skeletons belong to the 12th century to the 15th century. It is believed by specialists that the death of many people in this region was a result of landslides, blizzard or an epidemic. The human skeletons were re-discovered in 1942 by H K Madhwal, who was a Nanda Devi Game reserve ranger. Later in 2004, a team of Indian scientists along with some Europeans visited the area to gain more information about the nature of the skeletons. On extensive research and findings, they found human skulls, bones and other jewellery. The DNA of the skeletons was taken, and it appeared that the people belonged to many classes and showed different features and morphological structure. There was a group of short people and tall people who were believed to be closely related to each other. Though the exact number of the skeletons cannot be ascertained, but a total number of around 500 hundred skeletons were found. It is also believed that an equal number of skeletons perished due to the natural environment. The Radiocarbon dating of the skeletons at the Oxford University Radiocarbon Accelerator Unit determines the age of the skeletons to be somewhere around 850 AD. Later extensive research has been carried out in various parts of the country and the world. Many scientists are of the idea that the people did not die of an epidemic but due to sudden hailstorms. The hailstorms are supposed to be as big as the size of a cricket ball, and as there was no shelter in the open areas of the Himalayas, people might have come under its disastrous and direct effect. It is considered as one of the strongest reasons for the extinction of the natives of this area. The cold and icy weather condition can be said to be the reason for the preservation of the skeletons for such a long time. The favorable weather conditions prevented the skeletons to decay off and decompose into soil. With landslides that were rampant in the area, many bodies slipped into the lakes and stayed there for a long time. The bodies that fell into the lake had a greater shelf-life as compared to the ones which remained in the open. However it is still not determined if this group of people lived here, or if they were heading towards a destination. Historical evidence of any trade route towards Tibet has not been established. Therefore it is hard to decipher the real purpose of the group of people that were victims to this natural calamity. There are possibilities that the group may be heading towards the Nanda Devi pilgrimage where Nanda Devi Raj Jat festivities take place once every 12 years. Lohaganj is the starting trekking point for Roopkund. You can also reach Roopkund through Nanda Prayag which is connected by a motor-able road. The Roopkund trek can also be called Skeleton Trek due to the presence of different skeletons in and around the lake. The lake is surrounded by snow clad mountains and rock- strewn glaciers. Trekking in India and choosing the Roopkund trek is an adventurous journey which passes through many exotic and beautiful locations. As you trek towards the lake, you would find lush green grassy land and conifer forest ranging towards the fall of hills. Thereafter the trek takes its way along the Pindar River. You can enjoy the natural and lush green beauty of the surroundings with the pleasant breeze that blows all around you, giving a soothing effect to your senses. 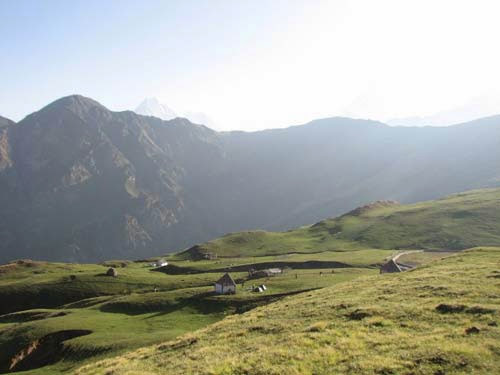 Roopkund is a picturesque, beautiful and attractive tourist destination in the Himalayas. Located at the base of two Himalayan peaks, Trishul and Nandghungti, it attracts people who have an adventurous side to life. There are religious festivals that take place in autumn, held at the alpine meadow of Bedni Bugyal, where the nearby villages participate. The lake is covered with ice all the time and it adds to its beauty. It is an enjoyable travelling destination as one is surrounded by mountains from all sides. 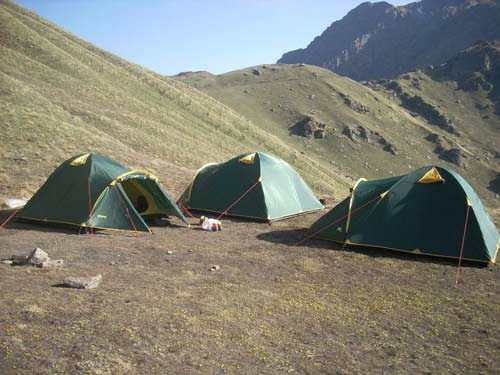 Trekking in Uttrakhand also gives you the chance to Backpack Holidays. You can also go for the Nanda Rajjat Yatra. There are many routes for a trek to Roopkund. One of the most common routes taken by travelers and adventurers is through Lohagunj or Wan up to where you can travel by road. Trekking begins after this point. There are also some plains or flat areas where you can camp during the night. If the weather is not foggy, you can easily see Bedni Bugyal and Trishul. 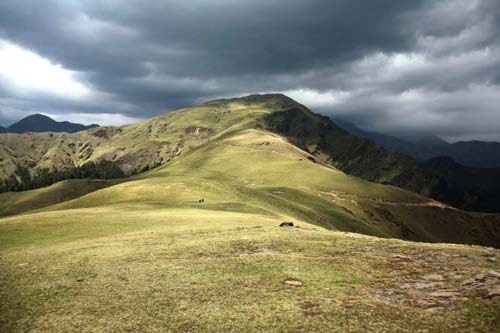 On your way to Roopkund, you would also find many grazing lands for horses, sheep and mules. You would come across a few temples and lakes on your journey. Many waterfalls are also visible on the slopes of the surrounding mountains. However, it should be kept in mind that the weather is generally hostile throughout the year and travelers need to be fully equipped and prepared for these conditions. You can reach Kathgodam through one of the most famous trains reaching the destination, which is the Ranikhet express. Once you reach here, you would start feeling a change in the entire atmosphere. The Roopkund trek has its starting point from here. The mystery lake trek would give you a remarkable experience you might just feel that you are living your dream. The Roopkund trek is also known as the skeleton trek as skeletons are what you would see on reaching the destination. Kathgodam is a small yet beautiful place . Once you reach Kathgodam, You can travel easily to Loharjung through the roadway. The roads are narrow, with beautiful curves and would give a good view of the surrounding. The lush green beauty that travels along is amazing. Just behind the bus stand in Lohargunj, take the trail that takes you to Raun Bagad. It is a fairly marked trail that descends through mixed forests. It is a moderate trek and you would take around 2-2½ hrs to reach the Ruan Bagad, which is an iron bridge across the famous Neel Ganga river. There is also an alternative route to reach here from Lohargunj which is through the road towards Wan. It is an easy 6km walk to Kulling Village where after there is a steep slope towards Ruan Bagad. You can opt for the latter, which is easy to travel but you would certainly miss on the beautiful mixed forests. Hereafter the climb to Didina starts once you cross the iron bridge. It is a difficult climb and you may get tired pretty soon. With a relatively tough time in the beginning, you would reach Didina in about and an hour and a half’s time. You would have e great mountaineering experience all this while. To reach Ali Bugyal from Didna, there are two alternative routes. If you look in the direction of the valley, you would look at Tolpani, which is a cluster of huts that belong to the shepherds. It is almost 3 kms away and 1000 feet high. From Tolpani, you take a trail that climbs to Tolkaan in the northern direction. The meadow trek goes through a series of switchbacks and grassy oak mountains. From Tolkaan, you take a sharp left towards the south and steer through the ridge to come out of the forest at Ali Bugyal. 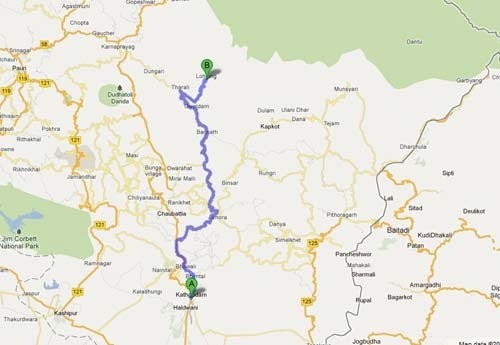 The alternative route is to climb directly towards Ali Bugyal without going through Toplani. You would certainly save on distance but it a relatively much steeper and tiring climb. 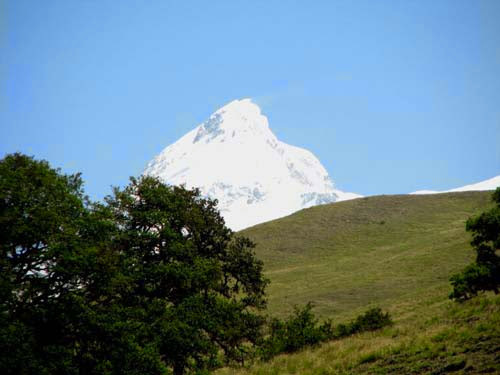 It takes nearly two and a half hours to reach Ali Bugyal on this route. To enjoy the seductive views from Ali Bugyal, you need to reach there before afternoon. It is a great post monsoon trek as well as a pre monsoon trek. The trek from Ali Bugyal to Ghora Latoni is an easy trek. You would follow a straight line ahead of you for about 3 kms. On your gradual increase to the slope, the trek brings you to the other side of the ridge. The view from this point is absolutely marvelous. Ghora Lotani is a brilliant campsite and offers you great views all around. It is an easy day and you will get time to relax and acclimatize to the weather conditions before going ahead with your trekking. In fact, you could consider spending a day here to adapt to the altitude and atmosphere. This is the day when you make a steep dash to gain altitude and finally trek in the snow line. The day’s snow trek will bring you to an altitude of 14,500 ft from 12,500 ft. It is an high altitude trekking and you would start feeling the effects of weather change and thin air and definitely the effects of high altitude. You would have to start your day early as you would like to reach Bhawabasa as early to acclimatize to the weather. Your route takes a climb to Kalu Vinayak, which is a steep and zig-zag way to take you up the mountain. Go through this section carefully and slowly. It takes around one and a half hours to reach Kalu Vinayak. The route from Kalu Vinayak to Bhagwabasa is simple and gradually sloping downwards. Bhagwabasa is 2 kms away and you can have a view of the Bhagwabasa huts from here. The trail towards Bhagwabasa goes through snow patches and you would enjoy the journey. You have to start the day as early as 5 AM. The sooner you start, the better it is for you as the snow is still hard, while later in the day, it would get soft and your feet would start sinking in. Roopkund is a 5 km gradually up-hill climb from Bhagwabasa. You will have steep climb towards the end of the trail to reach Roopkund. 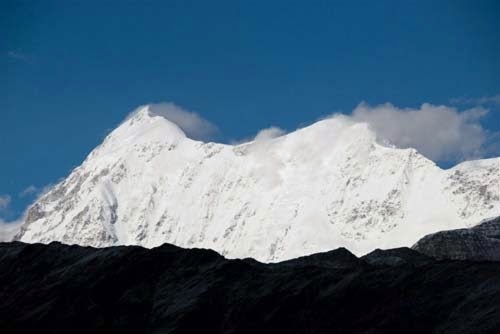 It would take about 3 - 3½ hours to reach Roopkund. Once you climb to Roopkund, you must climb up to Junargali. Trekkers must visit unless the weather is very harsh and does not permit you. The climb to Junargali is not long. It is around 200 ft and doesn’t take much time. It is hardly a climb of 25 - 30 min. You can start off early to return back to Bedni Bugyal via Bhagwabasa. You need to be careful in trekking back as the snowy slopes may trick you. Day 07: Bedni Bugyal to Lohajung via Wan. Bedni to wan (trek) wan to lohajung (drive). It is a great journey back to Lohajung via Wan. The path is fairly simple and you would not feel any distress throughout. You would cross the oak forest as you go and the scenic beauty is just mesmerizing. You would see the end of meadows after a few minutes. On a clear day, you would be astonished by looking at the Trishul on your way back from Bedni Bugyal to Wan. You would go down the Rhododendron forest. You would have a steep descent for the Neel Ganga. Faster trekkers reach there in approximately one and a half hours. However you should take your time and enjoy the beauty as you go by. From the river, it takes about half an hour to climb to the ridge above Wan village. Overall it takes about 6 and half an hour to Wan and it is an hour’s drive back to Lohajung. After getting to the base camp at Loharjung and finishing the Roopkund trek, you might think of spending a day at Loharjung. This is a great place to relax and chill out after your high altitude trek that has left your adrenaline pumping. You would enjoy the weather but definitely miss what you had at Roopkund or on its way. Travelling back to Loharjung is pretty simple and doesn’t really require any skill. An enjoyable road-trip to end the lake trek on an exhilarating note. Jet Airways, Go Air and Air India provide daily (once every day) flight service between New Delhi and Leh. In the summer season, the services may even be provided twice a day. However if you plan a trip to this area of the country, you must try to book your tickets well in advance. This might even cut down the prices which may be levied on booking at the last time. You would enjoy the flight as you would fly over many untouched areas and even some mountain ranges. The aerial view is just fascinating and gives a great start to your tour. The Kathgodam station is one of the main stations in the district and it is an old station. It has good connectivity to many places and these include Lucknow, Delhi, and Howrah. Tickets from Delhi to Kathgodam by train cost around Rs. 150 for a second class sleeper ticket and Rs. 400 for a third A/C sleeper ticket. It is essential to book the tickets at least one month in advance as this route is always in demand. 7. Transport from Kathgodam to Loharjung and return. 8. BACKPACK HOLIDAYS Staff insurance. Note : Normally BACKPACK HOLIDAYS expect to carry your personal luggage on your own, if you don’t want to carry your backpack so you can give it to porter, but you have to inform us in advance and have to pay Rs. 250/- extra per day per bag. The fee can be paid by online transfer/cheque deposit/ demand draft. Instruction for payment will be forwarded along with your confirmation email. 95% of Trek/adventure program cost will be refund. 70% of Trek/adventure program cost will be refund. 50% of Trek/adventure program cost will be refunded.